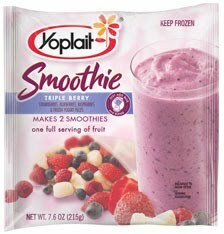 We just love Yoplait's delicious, easy to make smoothies! The smoothies are already packaged ready to go with fresh frozen fruit and yogurt, just add milk and blend! We love these smoothies because it's a great way to cool down, have a healthy meal replacement or make a yummy treat for the kids!